With the ongoing buzz of people worrying about the economy and their own funds, the term “low budget” is becoming used far more often. Today, we are going to be looking at AMD’s Athlon II X3 435 processor. 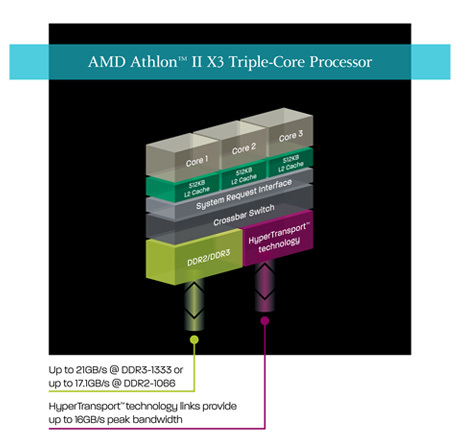 The Athlon II X3 435 has 1.5MBs of L2 Cache per core and is a 95W (45nm) processor. It supports all the same features found in the rest of the Athlon II processors (X2, X3 and X4 alike). However, AMD’s larger aim is based on it’s price point. With a amazing sub $90 price there should be no reason not to take a second look at the new Athlon II CPUs, especially if you are on a budget. Lets not forget about the array of testing ahead. Keep reading to see how the Athlon II X3 435 handled all the testing. Is this processor good for gaming. I mean playing latest games combined with a 9600GT 1GB. Can I play Battlefield Bad Company 2 on it? yes you can, I play the game at good fps using this cpu. You need a good video card to play this game smoothly. Something like an ATI 4850 will be great. How is it you say in the introductory paragraph “The Athlon II X3 435 has 1.5MBs of L2 Cache per core…” and then in the Specifications, “512KB of L2 data cache per core (1.5MB total L2 per processor)?” Isn’t that introductory paragraph a bit optimistic?